Here is the link to my blog portfolio, and here is the link to the corresponding reflections! Also, here is the way the historical ad(s) *should’ve* looked. Side Note: On my blog, it is saying I posted the assignment on Dec 9th, 2014. As you can tell from this post (dated Dec 8th, 2014) that is not the case. Just wanted to make you aware. If you’ve ever seen the classic family Christmas comedy, Home Alone, you’ll know exactly what I’m talking about when I say that only idiotic criminals like the “Wet Bandits,” are crazy enough to intentionally leave a “calling card” behind after committing a crime that could potentially land them right in the clink. No, that would never happen, it’s nothing more than movie magic that draws crowds to the theater. Nowadays, criminals can commit national and global crimes and authorities would not have the slightest clue who committed the crime or what his/her motivation was due to the sophistication of criminals and technology that exists today. As criminals become more and more sophisticated police are only getting further behind in the never-ending cat and mouse chase between both sides of the law. You may wonder why I am discussing any of this, well, it’s because as I was reading Carlo Ginzburg’s, “Clues: Morelli, Freud, and Sherlock Holmes,” the other day I realized why our authorities are quickly losing the war on crime: they are focusing on the clues a criminal would leave as opposed to the characteristics the police and the criminal would not ever think about. Ginzburg so cleverly points out that everyone has odd tendencies distinguishing them from anyone else on the planet that they cannot hide no matter how hard they try, and if police focused on looking for evidence of those characteristics instead of minor slip-ups that any criminal with access to CSI New York would know to avoid making, they would have a much higher likelihood of success. The first aspect of law enforcement that Ginzburg indicates could benefit from this style of thinking, is distinguishing a counterfeit piece of art from an actual piece of art. He begins by describing Giovanni Morelli’s, a famous art critic, method for determining if a painting is a counterfeit or not, which he dubbed the “Morelli Method.” The Morelli method is simple, when determining the legitimacy of a painting, never focus on “the most obvious characteristics of the paintings,” because “these could most easily be imitated,” instead, you should focus on the minuscule and intricate characteristics or tendencies of the artist, because these will be absent from even the best fake. You may think this method seems silly, but in actuality, it is what doctors use every day to diagnose illnesses, primarily mental, and it has proven very effective in other fields over the years. When a patient goes to see a doctor about how they are not feeling well, the doctor immediately begins to examine the symptoms the patient is experiencing to determine what the illness is. The problem is, that a lot of illnesses share similar symptoms, such as vomiting, diarrhea, a high temperature, the chills, headaches, stomach pains, and many many more, which means that without a very clear understanding of the assorted illnesses it would be nearly impossible to distinguish between different illnesses, which mean you cannot correctly prescribe medication, which means things don’t always end well for the patient. Doctors must use a method similar to that of Morelli to determine if a patient has the flu, a bad cold, or is showing early symptoms of lead poisoning, because all are treated entirely differently, but show very similar characteristics. Even Freud used this methodology while he was studying patients and actually described how what is “beneath notice” is the most important aspect of psychoanalysis because absent knowing the full reasoning behind someone’s (especially a criminal) thought process, it is nearly impossible to understand why they did what they did (Ginzburg). It is this method of psychoanalyzing criminals that police could greatly benefit from using. Think of how much more effective our police force could be if we could get into the mind of a criminal and think about all of the possible reasons he or she did what he or she did and how he or she did it? Now, you may be thinking, “well, that’s great, but this is pretty difficult to do given that the police will only see the aftermath of a crime,” but Ginzburg has a solution to that too. To answer this question, Ginzburg makes the obvious comparison between police work and hunting, but then takes it a step further. While Ginzburg makes the obvious comparison between tracking an animal and tracking a human that you are likely thinking of, ie, looking at foot prints, trails of blood, feces, hair, feathers, or whatever else an animal or criminal leaves behind, he takes this search a step further. He says that an expert hunter will “reconstruct the appearance and movements of an unnecessary quarry” in an effort to “give meaning and context to the slightest trace,” thus recreating the entire scene to fully understand what happened. This same concept of reconstruction is exactly what police officers need to use. Rather than just looking for typical “clues,” that any average Joe criminal would leave, to stop the great criminals, police officers much provide “meaning and context” to the clues to truly get inside criminal’s minds. If you’re still not convinced that this method of detective work is what our archaic police forces need to adopt, Ginzburg points out that the greatest detective to ever live, fictional or real, Sherlock Holmes, swore by this method of detective work. While the rest of the police force would analyze the obvious clues, Holmes would go a step beyond them and think of how a criminal’s past could influence his or her future decisions, or how miniscule characteristics such as the shape of one’s earlobe could lead to another potential culprit that the other detectives wouldn’t even know existed. I am not writing this article as a critique of our current police force, because I applaud their detective work, work that I certainly couldn’t handle, but rather I am writing this to explain why the more complex cases are consistently stumping our police force. Not every criminal is going to be like Harry from Home Alone, they won’t always intentionally leave a trail behind just to leave a presence, so police officers and detectives everywhere need to adapt to a more intelligent era of crime or suffer the consequences. Ginzburg, Carlo. “Clues: Morelli, Freud, and Sherlock Holmes.” The Sign of Three: Dupin, Holmes, Pierce. Ed. Umberto Eco, Thomas A. Sebeok. Bloomington: Indiana University Press, 1983. 81-118. Print. The Chronicle recently published “The Shadow Scholar” by Ed Dante, a pseudonym for a writer paid to write essays for slacking college students, critiquing the modern education system for neglecting student’s needs, thus forcing them to turn to outside sources to write their essays, but I think Dante has it all wrong. The education system should certainly not be critiqued for its neglectful response to student’s need of writing help, in fact, it should be praised! If it weren’t for the flawed education system, our country’s students would be far less resourceful, which is a characteristic that is almost nonexistent in universities nowadays. Dante falsely critiques these students for being lazy, rich, and moronic, when they should be being praised for being so resourceful. Dante said that he catered to three primary types of students, incompetent students, lazy rich kids, and ESL students, but his favorites were by far the lazy rich kids. The lazy rich kids were not necessarily incompetent writers, in fact they often had targeted and specific instructions for Dante and were willing to pay top dollar for him to meet their expectations. Although he argues that these lazy rich kids were simply banking on their daddy’s money getting them through life and that the education system failed them because it never forced them to think for themselves, I argue that this is a load of malarkey, and in all actuality the education system has simply set them off on a track for success. While it would appear that these students are just horrendously lazy, I believe that they are simply developing time management strategies that the straight-A “geniuses” are too stupid to ever adopt. When Dante sees lazy rich kids, I see students who prioritize the more important aspects of college such as shot-gunning PBRs with their buddies at tailgating parties over useless assignments like honors theses or papers for “a masters degree in cognitive psychology, a Ph.D in sociology, and a handful of postgraduate studies in international diplomacy.” I think Dante is struggling to see the forest through the trees, because although the education system fails to teach the future leaders of our country how to construct a coherent sentence, or accomplish any work on their own, or teach students who literally can’t speak English how to write the 20 page research papers it so abruptly demands of them, it does an excellent job of teaching time-management skills, resourcefulness, and metacognitive skills. These students who have supposedly been failed by the education system and are forced to hire others to write their essays for them are actually just students who went through a metacognitive process and determined that they are bad at writing, and therefore use their resourcefulness to develop a solution to their problem so that they can spend more time doing what they do best: getting wasted! Absent this supposedly flawed education system America’s students would not be blessed with this beautiful resourcefulness that is a necessary component of being a top level professor, business(wo)man, scientist, doctor, artists, musician, athlete, or any other career. Dante claims that he chose to write this article because after year after year of writing essays for students who can hardly spell their own name due to such a neglectful education system, he finally lost it and thought that something needed to be said to create a change. To better understand what leading institutions in the country thought about the article, we interviewed some of the top professors in the country. When asked about his opinions of the recent article, Dr. Paul Spellman, published professor of Behavioral Genius at a random community college in Mississippi was appalled at Dante’s piece and was quoted saying, “Never have I ever read such a naïve article in my life! Dante clearly has not had an up-close and personal experience with the genius that is, cheating, and he should think twice before throwing around such idiotic accusations again.” I think Dante’s push for an educational reform will simply cause the brightest students our country has to lose track of what is important and begin prioritizing their essays over their partying, thus reducing their incentive to be resourceful. While Dante believes that his article will create a positive change that will lead to better future leaders, I think this article simply disincentivizes creative thinking and resourcefulness that we as a society claim to support. I think by publishing this rubbish article, Dante single-handedly caused the downfall of our excellent education system, which will in turn create idiotic leaders, and will likely cause a collapsed economy, global war, and who knows what else. Although the classic 1959 romantic comedy, Pillow Talk, might seem to be just that, a romantic comedy, it is so much more. If you have never seen the movie, Pillow Talk, it is a hilarious rom-com portraying lives of Brad Allen, played by Rock Hudson, and Jan Morrow, played by Doris Day, who have a shared party phone-line and just can’t seem to get on the same page. Brad Allen is your stereotypical suave lady-killer who seemingly never stops seducing attractive women over the phone, while Jan Morrow is an independent interior decorator who is driven up the wall by Allen’s inconsiderate use of the telephone. Director Michael Gordon expertly weaves together their two entirely different lives and creates a clever take on the classic hate turned to love story. Entertainment aside, what makes this movie so interesting is it’s portrayal of men and women and the different roles and stereotypes associated with being a man vs. being a woman, and primarily the sexist attitude toward women at the time. Although the study of gender roles in films has certainly been discussed before, I think this movie provides the opportunity for a unique discussion of gender studies that other articles have excluded. What makes this movie such an excellent piece to analyze is it’s usage of the split screen to provide an extremely clear depiction of the lifestyles of the two characters and how they differ and interact. I will first focus on Brad Allen’s house, which is a traditional bachelor’s pad. When looking at Brad’s apartment, you immediately notice a dark color scheme on the walls, with lots of greens and browns as well as bare brick, often with dead animals mounted on them, dark leather chairs and couches, a bar, and complex electronics and electronic systems, many of which are designed exclusively to provide easy access to a romantic environment with a comfortable bed. The dark color scheme and dead, mounted animals indicate that this apartment is supposed to be a manly environment, which is enhanced by the other amenities of Brad Allen’s apartment. The brown chairs and the bar are textbook elements of a mancave, and the romantic electronic trickery is just the icing on the cake. Turning the lights off, playing romantic music, and producing a bed, all at the flick of a switch? Although that may not be the largest turn-on for the women he brings back to his apartment, this fancy set-up definitely improves Brad Allen’s ability to score, making it ideal for his apartment. Finally, he keeps a large piano front and center that he uses to write songs as well as romance women. In contrast, Jan Morrow’s apartment is what you would stereotypically expect from an independent, female, interior decorator. He house was painted in bright and pleasant pastel colors with a lot of white accouterments filling the apartment. Her apartment had nice mirrors and ruffled curtains and pretty plants to add some decoration. And most importantly, her bathroom is large and well equipped for Jan to participate in her daily toilette. By using the split screen view of these two apartments side-by-side, the viewer is able to see how starkly the stereotypes of a woman and a woman’s apartment contrast with those of a man and a man’s apartment. While watching the movie, I believe that there are two specific examples of this split screen view that best depict the dichotomy between two different apartments and their respective stereotypes. The first is when Jan, Brad, and Brad’s lover are all on the phone at the same time and the screen is divided up into three triangles, one for each of them. In the lover’s and Jan’s triangles, the colors in the backgrounds consists of pretty purples and blues, lots of nice pillows, bright blue bookcases, and pretty plants and flowers. In contrast, Brad’s apartment consists of a dark brown wooden piano, brown walls with old traditional paintings hung on them, and dark lighting everywhere. When looking at this picture, the hue of colors takes a dramatic shift from Jan’s apartment to Brad’s apartment. This contrast is also starkly visible during the bathtub conversation scene, where the scene is split between Jan’s bathroom with her in the tub, and Brad’s bathroom with him in the tub. On Jan’s side of the screen, her wallpaper is a pretty pale blue design, she has a brighter color brown shower curtain with her initials monogramed into them in blue, and she has jars of assorted shampoos and body washes on the edge of the bathtub. In Brad’s bathroom however, his wall is designed with grey tile and a picture of some leaves, he only has soap, and his curtain is a plain dark brown. These stark contrasts are representative of the stereotypes of women and men respectively. In an effort to find an explanation behind the different portrayals of men and women in this movie, I began doing research about the reasoning behind the bachelor pad depicted in the film and stumbled across and outstanding article by Jessica Sewell titled, “Unpacking the Bachelor Pad,” that describes why men have this desire to create a bachelor pad like Brad’s. Well, according to Sewell, men during the 1950s had a desire to lash out against women, who were considered controlling, and design an apartment to be the antithesis of what a woman would like. This concept is especially perpetuated in Pillow Talk through the assorted interactions Jan and Brad have, in which Jan tries to act rationally and proposes plans to Brad on how to share the phone, but instead of cooperating, Brad gets sassy and defensive and deems Jan’s requests as nothing more than nagging, and therefore lashes out and uses the phone even more. Although all of these different interactions and portrayals of Jan and Brad’s relationship are important, the most significant event in the movie as far as gender roles are concerned comes at the very end. After Brad tricks Jan into a romantic relationship and Jan finds out, Jan gets really upset and refuses to continue the relationship, but somehow, by the end of the movie Jan and Brad end up in bed together. This ability for the man to seduce the woman after behaving in a terrible fashion demonstrates how women are portrayed as controlled by the man, and how if the man doesn’t get exactly what he wants, he will just behave in an inappropriate manner until he does. Although this film is over 50 years old, these gender role stereotypes are still very much a part of modern society and Pillow Talk is one of the best examples possible for clearly portraying these gender roles. I hope this will increase your awareness of these gender roles so that you can identify them and avoid them yourself, because they force women into the role of a nagging nuisance who is able to be controlled to do whatever the man pleases with enough prodding. If there’s one thing I’ve learned over the years, it’s how powerful of a tool Facebook is in provoking social change, so when news of a local dognapping spread, Facebook users around the country made sure to tell people. I was so moved by the constant posts of miscellaneous news articles telling me that poor little Doge was taken from his estate in Texas that I nearly broke into tears. I was so happy that everyone felt compelled to show me that they read the news, it was just so overwhelming. Absent the moving posts on Facebook, social change would be non-existent. I mean, when Hurricane Big Boi leveled Florida, Facebook users were so upset that they began posting videos of themselves standing in the rain to demonstrate how they felt the same suffering those in Florida felt. If that’s not social change, I don’t know what is. I’m just thrilled there is such a good platform for creating change and conversation. As the search continues to return Doge to his owner, local Dallas billionaire, Jeff Franks, Facebook users continue to voice their opinions. Here are some of the more meaningful posts we have collected over the past day: Chote social activist Jimmy says, “Look at this news article about Doge, I just wish I could do something,” Bel Air Academy head cheerleader Rachel says, “I love Doge soooo much! This is just so sad! Like, I can’t even!” Columbia sophomore James says, “I am just so upset by Doge’s kidnapping that I am going to let my dog run away from me in Central Park so I know how it feels.” Those are just three of several million posts by concerned citizens. James’s release of his dog tugged at so many heartstrings that dog lovers around the country began to lock their dogs up in cages with muzzles on and no food and water and vowed to keep them there until Doge is returned in and effort to protest the mistreatment dogs in this country. The efforts to spread word of the terrible mistreatment of dogs by kidnappers in this country has been mitigated though by contrarians starting fights all over Facebook. With each post by someone expressing their angst over the recent dognapping comes a slew of angry arguments in the comments feed. My Facebook wall is filled with my assorted college and high school peers making sure their thoughts about everyone else’s opinions are heard. While these arguments may seem to slow down the process of finding doge, it is so helpful to bicker back and forth in comment feeds while angering all your friends on Facebook. Although all that anger may seem silly at first, everyone knows it will eventually translate into positive social change. As soon as national news sources like CNN and NBC get ahold of these Facebook comment threads, and they relay them to the government, the headlines practically write themselves. “Local 18-year old kids at East High School End all Animal Cruelty World Wide,” “16 Year Olds in New Jersey Stop World War 3 With Self-Expressive Comments on Facebook,” “Outraged 20-year old Students at Family Money University End Poverty With Heated Facebook Conversation.” The headlines are endless, the change is not. Although some experts might claim that rather than conversing about each other’s opinions on Facebook, people should donate money, food, water, shelter, or in the case of poor Doge, their time to search, to those in need, those experts are extremely misled. Think about it. It is far more productive to lock one’s dog up in protest and post a status about it than it is to help search for the lost dog, and it saves a lot more lives by spreading the word of the pain experienced by those whose lives were uprooted by Hurricane Big Boi via a video of one in the rain than sending care packages. Frank Mickelson, local dog lover in Texas said that “I think that rather than taking a few hours out of my hectic schedule of eating BBQ and watching UT Football this weekend to help find Doge, my time is better spent by posting videos of me angrily yelling about the mistreatment of dogs.” This is just such a clear example of one of the many ways Facebook can be used as a tool for reform as opposed to simply a social media site. Although Doge was never found, it was certainly not due to the lack of effort from Facebook users across the country. People tried their darndest to make their opinions known by locking their dogs in cages without food and water for days at a time, but the only change that happened was a massive spike in doge malnutrition issues. At least these dog’s anorexia is for a worthwhile cause, and people will know in the future to take better care of their dogs. The four blogs I chose to revise were my Facebook Representation blog, my Investigations blog, my Bachelor Pad blog, and I re-revised my already revised “Shadow Scholar” blog. One of the primary reasons I selected these blogs is that I felt like they were four of the most interesting topics we discussed throughout the course and I thought that given the guidelines for the portfolio they provided me with the most material. I felt like the Facebook blog was interesting because instead of talking about how I use Facebook like I did in my original blog, I morphed the blog into a satire about how Facebook is used by people today. I didn’t want my blog to just be a basic description of what I like to do on Facebook, because that is not a very exciting piece to read, which is why I chose to change it into satire. I liked the Bachelor Pad blog because I could turn what was initially a simple comparison between the movie, Pillow Talk, and an article about the bachelor pad by Jessica Sewell, into an analysis of gender studies and how they are portrayed in film, which is essentially a more in depth and specific version of my initial blog. I thought the Investigation blog was a good one to discuss because it is a really fun and interesting topic that can be applied on a larger scale in an article setting to create a larger impact than just a short analysis in my blog. Finally, I chose the “Shadow Scholar” blog because I thought it was a really interesting topic that is especially pertinent to a college student and that I can turn that blog into a satire to make it more appealing to some readers, yet still get the intended message across. As far as how I went about revising the blogs, I began by re-reading my blogs to determine which blogs I thought I wanted to revise. After determining which blogs to revise, I decided which topics from each blog I wanted to revise. I then began reading articles from the different news sources we were supposed to mimic to learn how they portray their articles. After selecting which news sources I wanted to replicate, I revised my blogs according to their different styles trying to keep a similar topic to my original blog. Although I thought there were several good blogs I could have revised, I thought those 4 blogs gave me the most material to work with and were the blogs that I found most interesting. I enjoyed using collaborative composition as a means to improve my writing and help others improve their writing. I particularly enjoyed providing comments as a peer reviewer because it allowed me to read over my peer’s work and figure out what they wrote about and how they wrote about it, and how my writing differed from theirs. It also gave me the ability to provide, hopefully, insightful feedback for other students to use, and recognize what I liked about their writing and didn’t like about their writing and then apply those concepts to my own. I also found it helpful that my peers would comment on my work too thus allowing me to get a new opinion on my writing. Reviewing my own work can sometimes be rather difficult because after writing a piece the last thing I want to do is discover all of the bad aspects of it and then spend time changing them and tearing apart the work I spent so long completing. By working in a setting where other kids review my work I am able to get that advice from a third party, which makes it easier to change. I also find that there are sometimes parts of my piece that I like and I therefore think others will like, when in all actuality others don’t, and absent that peer review process I would have never known. I think group work was excellent at providing me with that extra evaluation that we ordinarily wouldn’t get by just reviewing our own pieces. I think my writing has become more concise because I have tried to condense longer analyses into a blog length piece, which can be difficult for me to do. My primary shortcoming is that I often write long wordy pieces that could easily be cut down with more revisions, which this peer review process and the blog process has really helped with. By being constricted by a 500-word blog post, I am forced to condense my writing and make sure that I only get the most important elements out of my writing and get rid of all of the fluff. I think this has improved my writing because now it is more concise. I believe that my reading habits have also improved because my annotation quality has increased. I primarily found the reading of the Ginzburg piece helpful in improving my reading habits. As a new school year approaches, I know that the University is looking for new things to integrate into the Creating Emory curriculum. I would like to suggest an article that would do an amazing job of complimenting the initiative of Creating Emory, and this article is “Why People Code Switch.” This article, which would be read and then discussed by each orientation group. As opposed to most of the discussions that take place in Creating Emory on different cultures and they way they interact, this article investigates how the same culture interacts with itself. By reflecting on the reasons behind code-switching, students become more awake of the social pressures we all face to speak or act in certain ways. After all, how are students supposed to truly understand and be open to all of the different cultures around them when they do not even understand their own? My hope is that through work-shopping this article, that students will become awake of the misconceptions they have of those around them, not necessarily because they prejudiced or ignorant, but because they are aware of the social pressures affecting those around them to speak and act differently than how they truly are. Maybe after a little bit of enlightenment and awareness of the code-switching phenomenon, students will not only have a better understanding of those around them, but also become aware of the times they code-switch due to social pressures and be fearless enough to challenge the social norm, speak and act how they want to. A more aware community is one that is able to embrace its true self. In this course, Technology and the Senses, many of the texts we studied and the ensuing discussions revolved around futuristic or alternate societies, like a world where people could fall in love with their operating systems (Her), or a world without food (Soylent). We also had thought provoking discussions revolving the different the different senses and what affect different sensations had on the mind and body. In addition to the various texts, films, ads, etc. that we have examined this year in relation to English 101, I would suggest adding the book, The Giver, by Lois Lowry to the required reading list for this course. The Giver is set in a society void of emotion, feeling, choice, and color. The society is all about rigid order, peace, and sameness. While there are no negative sensations in this society like pain or war or hunger, there are also no positive sensations, such as music and passion and color and joy. Nobody in this society has individual identity or freedom of expression. However, one member of the society is responsible for keeping the ‘memories of the past’ in order to ensure that history is not repeated. This person has a lens into what normal life could used to look like – the memories he or she keeps range from memories of sunburns and sleigh rides to romantic love and death. This person protects the other members of the society by taking the whole burden of past memories and feelings. The protagonist, Jonah, has been selected to be the keeper of memories. He soon realizes how miserable and bland his society is and yearns to escape to a more colorful and exciting life where he’d have free choice and be able to experience extremes, both good and bad. The theme of sensation and the relationship between pain and pleasure is very prominent throughout The Giver. Reading and discussing this text in class would have enhanced existing discussions relating to senses and sensation had it been included as part of the course. Lowry’s novel emphasizes the importance of physically experiencing things such as touch, sound, and sight and shows the reader what life would be like with very limited sensation and freedom. Also, as mentioned above, The Giver takes place in an alternate society, a world with no depth – something else we have studied in English this semester. It can be beneficial to discuss alternate societies, that have different customs, values, and beliefs than that in which we live, in order to get a better idea about one’s own culture. I think that if our class had read The Giver this semester, or at least seen the movie, we could have had interesting and thoughtful discussions that would have added to the class as a whole and helped people realize the importance of sensation and advancement, whether it is technological or societal. There are several very interesting articles that we have read throughout the semester in my English 100 class about technology and the senses but there was one that stood out to me especially because of the way that it relates to Emory University and one of its major ideals. This was the Sherlock Holmes story, “The Adventure of the Cardboard Box” by Arthur Doyle. Emory University stresses research on a daily basis. Emory University encourages research throughout all fields and areas of study in the college and graduate studies. One of the six main links on the Emory University’s homepage is dedicated solely to research. This shows how integral research is to the university. There are examples everywhere of why the leaders of Emory University believe research is an amazing opportunity for students. As a result of these amazing research opportunities I occasionally find myself wondering whether I should be participating in this aspect of Emory more than I currently do. Emory could take their love of research of the next level by requiring all students to read “The Adventure of the Cardboard Box” by Arthur Doyle. This would show students the commitment of the university to research and how research is not necessarily just done in a lab with biology or chemistry but it can be done in all fields of study. Doyle’s “The Adventure of the Cardboard Box” is not what I would consider to be literature that I expect to read in school. However, there are definite benefits of this reading. While being a very interesting and entertaining story, “The Adventure of the Cardboard Box” gives the reader a clear understanding of how research can help someone on a daily basis. Although Sherlock Holmes’s research is not necessarily what students would be researching, his experiences with inference and examination of specific situations show how dedication to a topic can result in major successes for the researcher and many others as well. Doyle’s “The Adventure of the Cardboard Box” has an exciting plot as opposed to many other pieces of literature that we normally read in school. This short story contains many different plot twists and exciting moments that one would not expect from school literature. Sherlock Holmes is able to understand the crime completely before anyone else and then informs the audience and the people whom he works with after he has solved the mystery himself. These amazing inference and research skills shown Holmes show how research of a specific topic can result in major successes. If all Emory University students were required to read Arthur Doyle’s “The Adventure of the Cardboard Box” it would give them a better understanding of ways in which research at Emory is not what we all think of on a daily basis, but how it can be in many different forms. I believe with the addition of this reading to the curriculum for all Emory University students would increase the student participation in research and show all students how important research is to Emory University. Our school, Emory University, emphasizes diversity. International students from different countries fly to America to bring distinct thoughts to the Emory community. What I want the class to read is an article. It is from New York Times titled “U.S. Immigration Laws Face New Scrutiny After Killings.” These days top issue that floats around the world is an immigration issue in U.S. Immigration issues were continuously debatable since the nineteenth century. There were several acts passed by the federal state such as “Chinese Exclusion Acts.” U.S. government was concerned about U.S. workers’ jobs exponentially losing and the unstable economy. Students in English Expository class are also diversified. This article will be suitable and appropriate to discuss in class. First of all, to give an introduction of this article, the Republicans oppose against Obama administration that supports and tries to help illegal immigrants in America. To get to the point of this article, an immigrant who was deported twice killed two sheriff’s officers in Los Angeles. The illegal immigrant was deported because of drug and weapon issues. Moreover, the fact that this immigrant was deported twice reflects the government that they do not enforce law strong enough to prevent these situations. There was also a couple and a boyfriend who was an illegal immigrant got help from his girlfriend to stay in America secretly. When someone reported that the couple was drug dealing, the couple shot Sacramento deputy and ran away. In class, we can discuss how the federal and state government should act differently to enforce immigration laws efficiently? Do you want the immigrants to stay in America or not? What should the seventh largest immigrants in State of Georgia act upon against illegal immigrants? These kinds of discussions might raise disputation between the international students and U.S. students but it will also be a key to resolving the misconceptions both sides have. To be honest, Emory should have no rights to brag about their diversity. There was some racist occurrence in the Emory community and gave disappointment to the students. Also there is a barrier between International student’s side and U.S. student’s side that both sides of the students cannot get close to each other. Having these kind of discussions will have a high possibility to break the barrier and students will converge together. After discussion, there will be a lot of diversified groups working and socializing in the cafeteria, library, cafe, and other public places. This way will make Emory community the true “International Community” with no doubt about it. Some students might not agree with immigrants staying in the U.S. but the whole point about this discussion is to at least try to influence and convince those who oppose. This discussion will not only enhance the disputation on immigration issue but also increase skills of compromise and understanding other side’s perception. Especially at a school like Emory, there is a great amount of diversity and with diversity comes differences among groups of people. Being able to have everyone read and watch the same thing would help bring the community together. I think that if there was one article that all Emory student should read the one I would pick would be combination of “How Code-Switching Explains the World” and “Five Reasons Why People Code-Switch”. I believe that when starting college people change the way that speak to one another and sometimes it makes others feel like those people are ‘fake’ or not genuine. I think that my reading these two articles students will have a better sense of how to communicate with one another. I thought that both articles help explain the differences betweens students depending on their background and their family life. Both articles discuss reasons for code-switching including the difference between talking with teachers and students. That example is one of the important ideas that students should know about before starting college. For the first time people have to learn how to handle situations by themselves including with professors. A lot of students do not understand how to speak to adults respectively and I think that learning about the idea of code-switching would help college students know how to act in that situation. The second reason that I think students should read this article is the fact that a lot of the time people code-switch in order to fit in with a certain crowd of people. College should be the time for individuals to find themselves. After reading this article I would hope that people are better able to understand that if they are just themselves they have a better chance of finding someone who they are able to get along with. I think that by allowing students to understand what their peers are thinking they will build better relationships in the future. Other all I think that by having all Emory students read the same articles it gives them a better opportunity to share similar thought and engage in conversation about the issue. There are many positive things that come out of students engaging in conversation with one another and being able to know when they have to code-switch in order to talk about some bring meaningful versus causal gossip. Emory University would benefit by having all freshman students read “How Code-Switching Explains the World” and “Five Reasons Why People Code-Switch“, two articles that would help students learn how to talk to professors as well as their peers allowing for great conversations and ideas to be born on this campus. I have really enjoyed my time in this class. During this class, we have explored how technology has changed and actively affects our lives, and through our readings, movie screenings, the games we’ve played/explored, and our historical ad objects and looked at how things have changed with several of our senses, such as those of taste and smelling. In addition, all of the works that we have read or gone through have augmented our experiences, especially some of the depression simulation ones and such. But, despite this, I wish that there were some other works that we had read. One such work that I wish we had gone over was the movie, The Matrix. This movie is interesting in many different ways. It has a commentary on technological innovation, our brain and our senses, and has a philosophical standpoint as well. But, for this class, technology and the senses, we would focus on the former two points for our discussions. In regards to the technological aspects, we have often discussed technology and how it has affected our lives. Our historical objects focused on just that: how certain objects affected one of our senses or changed the way we saw, tasted, or etc. things. While the movie does not specifically delve into those such subjects it does, as a backstory, talk about what happens when we go too far with technology. What happens when we go too far in the name of science and technology, and create something we can no longer control? For that matter, what happens when we try combining ourselves with technology, as what happened in the movie. But even further than that, we can start discussing exactly what it is our senses are, something which is introduced in the very beginning of the movie. The movie opens up with our protagonist, Neo, getting strange instructions, and soon, we learn that the world he was living in the whole time doesn’t really exist. Or does it? Just because it is in a computer doesn’t quite mean it doesn’t exist. The computer (an insanely powerful one, I might add) simulated for all the different people (or programs) what certain sensations what feel like and sent that to either the program’s central processes or in the case of humans, through wires to their brains. So, once we have this basic premise down, we can start discussing a couple of things. What is it exactly that makes up our existences? Our experiences, sensations, and memories? But, if these can all be fabricated through electronic means, what exactly does it mean to live? And in that case, what exactly are our senses? What makes them up, and what are they? While I don’t have a particular answer to these, I would love to see these question answered. I feel like a lot of people may watch the movie for the movie, and may not ask themselves these questions, either because it is in a movie or because the technology seems so far away. But the technology is not necessarily the focus here. Rather, I am asking everyone to consider the questions raised by the technology in the movie. When nail polish was first invented in around 3000 B.C., it was used for very different purposes than it is used for today. Back then, it was used by men and women in many different societies to distinguish between social classes. Now, it is used by women predominately for fashion purposes. Nail polish started to gain popularity in the fashion industry during the late 1930’s once companies began producing and advertising colored polishes. In this essay, I plan to examine this rise to popularity by analyzing the advertisements created during this time period. The first advertisement I chose to examine is for Graf’s Hyglo nail polish powder from The New York Times on March 21, 1915. Although this advertisement isn’t for colored nail polish, I felt that it was important to look at because it plays a role in how colored nail polish advertisements were created. At the top of the page, in large print, the advertisement reads, “Exquisite Nails” and then there is a picture of a thin female hand with well-groomed nails. Directly following the picture, the advertisement gives the name of the company and the product in large print. In much smaller print at the bottom of the page, it gives a description of what the product does and how to buy it. The description at the bottom of the advertisement and the picture of the hand make it clear that the company is targeting a female audience. By placing a female hand in the center of the advertisement instead of a man’s hand or a more ambiguous looking hand, Graf is attempting to draw attention from the women reading the paper, not the men. In the paragraph describing what the polish does, the adjectives used seem to be chosen in order to entice women into buying the product. The polish is described as a “brilliant, transparent, lasting polish, delicately perfumed, daintily tinted and absolutely waterproof”. The words delicate and dainty stand out because they are uniquely feminine. Most women aspire to be described as delicate and dainty, whereas most men would rather be described as tough and strong. I think that this is the most compelling part of the ad, as it plays on women’s desires to be feminine. If Graf put a bigger emphasis on these adjectives rather than “exquisite nails”, I think that the rhetoric appeals of the advertisement would be more successful. Revlon was the first company to create and advertise colored nail polish. The first advertisement I found is from 1945 and is advertising four new shades of matching nail polish and lipstick. It is important to note that the advertisement was created during World War II because it alludes to the war in many ways. 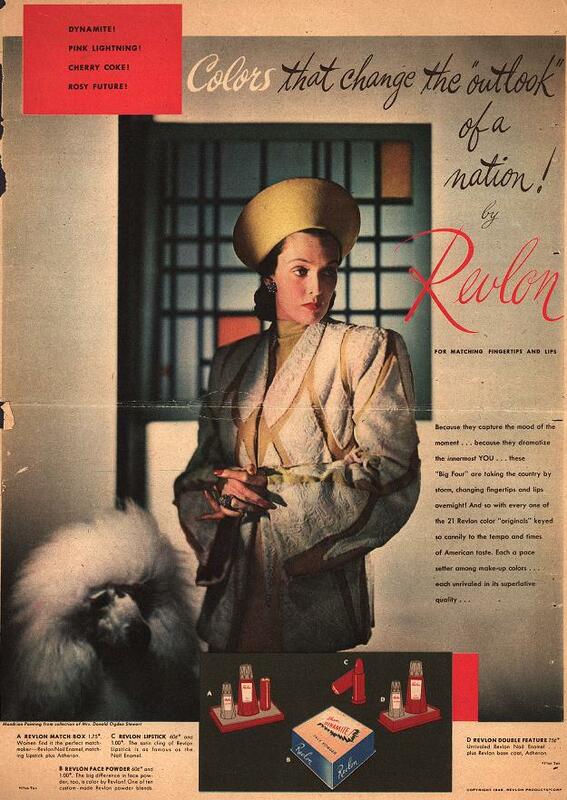 The background picture of the advertisement is a very elegant looking woman wearing Revlon’s products with a large fluffy white poodle by her side. The advertisement gives the names of the new shades, which are “dynamite, pink lightning, cherry coke, and rosy future”. In large print, the advertisement reads, “Colors that change the ‘outlook’ of a nation!”. The description of the product in smaller print really focuses on America and changes in the country. For example, it claims that the shades “capture the mood of the moment” and that they are “keyed so cannily to the tempo and times of American taste”. All of the shades relate to war and American patriotism in different ways. Both dynamite and pink lightning refer to the sounds of war, while cherry coke and rosy future refer to American pride. I think that Revlon chose this strategy of advertising because of how the responsibilities of women changed during the war. Women began working in positions that had previously been reserved for men. Some women even served in the Army. I think that the advertisement tries to mirror this sense of feminine strength and capability. It claims that the shades will “dramatize the innermost YOU” and that they are “pace setters”. Revlon is linking their products with American pride in order to sell their product. The final advertisement was made in 1950 for Avon’s collection of 13 lipstick and matching nail polish shades. A close-up picture of a beautiful woman wearing nail polish and lipstick that match the rose that she is holding takes up the majority of the ad. There is also a description of the collection at the bottom, followed by an illustration of each lipstick and it’s matching nail polish. The italics used in the description are meant to draw the reader’s attention to certain phrases. The three phrases that Avon chose to italicize are, “feels so good”, “doesn’t dry your lips” and “wears beautifully”. This shows that Avon is really focusing on product quality and glamour in this ad. They also emphasize the versatility of the product by showing how the different shades would look good on different people and with different outfits. The woman wearing the products is also a symbol of glamour because she is wearing huge diamond earrings and her makeup is done perfectly. The rose she is holding symbolizes love and classic beauty. Looking at these three advertisements together, it is clear why the nail polish industry has been completely dominated by women. While there is nothing inherently gendered about nail polish, most companies have never tried advertising towards men. Take Graf’s Hyglo nail polish powder for example. It is clear from their advertisement that they are targeting women, yet their polished isn’t even colored. By only targeting this female audience, they miss out on the potential market of men who would use this clear polish because they want well-groomed nails. The second advertisement by Revlon is also targeting women, but in a different way. Compared to the first ad, the second advertisement is targeting a much stronger, more independent woman. However, we must consider that a lot of men were away at war when it came out. While the men were at war, the role of women in America changed considerably. So I think it is fitting that the advertisement by Revlon targets a much more powerful and influential woman than Graf’s dainty and delicate woman. The third advertisement by Avon resembles the first advertisement in the sense that it is targeting a much more passive and submissive woman. Although the three advertisements may differ in how they try and appeal to women, they all have one thing in common. All three advertisements focus on women’s insecurities by targeting women who might be vulnerable about their appearance. These nail polish advertisements try to entice women by making them think that they must have the nail polish in order to be perceived as beautiful. “Avon Brings You 13 Shades in Color-last Lipstick and Matching Nail Polish” Advertisement. 1950. Duke U. Rare Book and Manuscript Lib. Ad*Access. Web. 4 Dec. 2014. “Exquisite Nails” Advertisement. The New York Times 21 Mar. 1915. ProQuest Historical Newspapers. Web. 12 Sep. 2014. Revlon Products Corporation. “Colors that Change the ‘Outlook’ of a Nation!” Advertisement. Sunday News. Duke U. Rare Book and Manuscript Lib. Ad*Access. Web. 4 Dec. 2014. In English 101: Technology and the Senses, students learn to relate different forms of technology to methods of writing. Throughout the course, the objective is to have first year students practice improving their writing skills while bringing a focus of technology and the different sensory modalities to their work. Although writing is the main focus, reading pieces that relate to the two main topics of the course allows students to learn more about other writers’ methods of how to create quality pieces of literature. In addition, students watch and reflect on how these films relate back to technology and the senses. One film that the class watched is called “Pillow Talk”. The movie is based around a telephone, and portrays how easy it is for people to “code-switch” while using it. Code-switching is when people talk and act in different ways depending on the situation that they are in and the people they are with. In the movie, the main character, Jan, strongly dislikes the man who shares her telephone line and constantly yells at him over the phone. The man, Brad, speaks to Jan in a condescending voice over the phone, but when he finds out who she is in person, takes on the persona of a charming man from Texas. Because neither of them had met the other in person, both of them code-switched when they were together because they no longer had the same relationship that they had over the phone (or so Jan thought, as Brad was well aware of who she was). The movie “Pillow Talk” includes both of the main themes of the class: technology (the telephone) and the senses (speech/hearing). Without the telephone, which uses speech to relay messages, the two different relationships between Brad and Jan would not exist. Also, code-switching has become a very prominent part of life, as everyone must learn that it is not acceptable to talk to a professor in the same way that they talk to a best friend. Brad and Jan use code-switching to transfer from one part of their personalities to another because both parts of the personalities shown in the movie do not work for both of the relationships that they have with each other. In addition, the film itself is another aspect of technology and the senses because it shows a visual representation of the story. As opposed to a book or an article, movies allow students to use more than just their eyes to learn about a story. The connection between technology and the senses is very present in films because one can see pictures and listen to different characters in order to learn about what is happening, while books or articles force the reader to read just words and hear just their own voices in their heads. Based on this reasoning, the movie “Pillow Talk” should be shown to all Emory students because it will further their abilities to observe, discuss, and reflect on the importance of technology, the senses, and the relationship between the two. “Pillow Talk” encompasses all of these aspects that lead to quality writing skills, and that paired with how enjoyable it is to watch would benefit all students at this university. Office hours: Mon. 2:20-3:50 p.m. & Wed. 10:20-11:50 a.m.